Cycnoches [Cyc.] - NATURAL - Catasetinae Canada Your Catasetinae Orchid Connection! 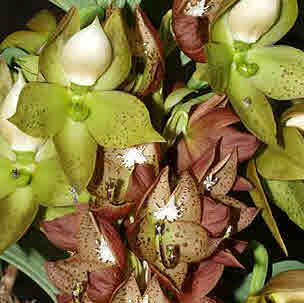 Cycnoches (Species and Hybrids) genera, awards, species checklist, slideshow, etc. 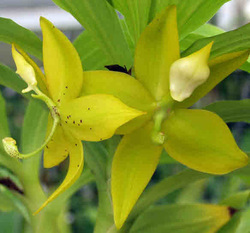 'The Swan Orchid' can be divided into two categories. In the eu-Cycnoches section, the male (staminate) and female (pistillate) flowers resemble each other closely. In the heteranthe section, the male and female flowers are distinctly different in the lip form and appear to be separate species. Both male and female flowers are attractive though the female flower often has larger segments. eu-Cycnoches male & female flowers. Photo courtesy of SVO. Heteranthe male & female flowers. Photo courtesy of SVO. sympodial with very large, thick pseudobulbs covered in a layer of paper and with a spray of large veined leaves mostly near the top of the pseudobulb. (21-27C) during the day and 10-15°F (6-8C) cooler at night.